So normally this week would be the reveal of all of the spaces that everyone has been working on for the last few weeks, but since we got an extra week added onto this fall’s schedule today we’re sharing all of the last minute details! And, that’s a very lucky thing for me this week. I completely forgot what day it was and that this whole daylight savings time existed and the electrician was able to squeeze us in tonight, so what all that means is that most of the pictures for this weeks post are taken in the dark. The big photography and blogging no-no. I’m going to chalk it up to a prego brain fart, but I promise next week we’ll be back to share all of the pretty pictures anyways! 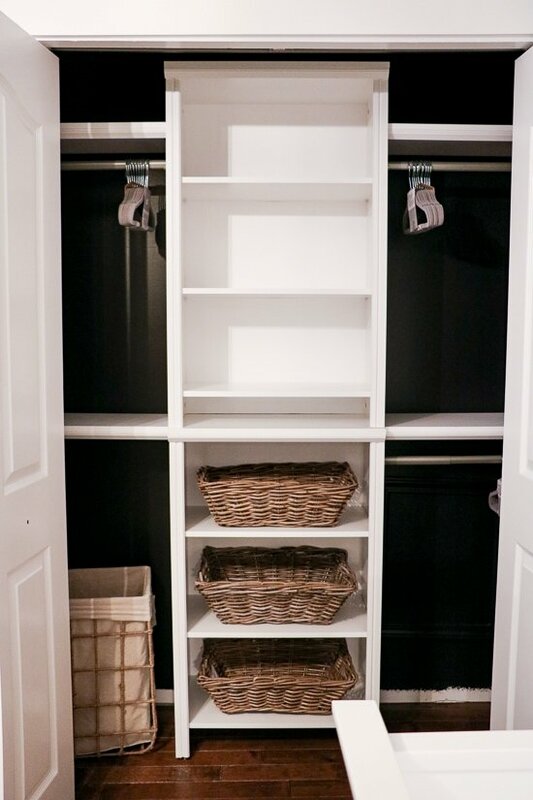 This week we focused on tackling the closet and a few of the smaller projects we added to the list. 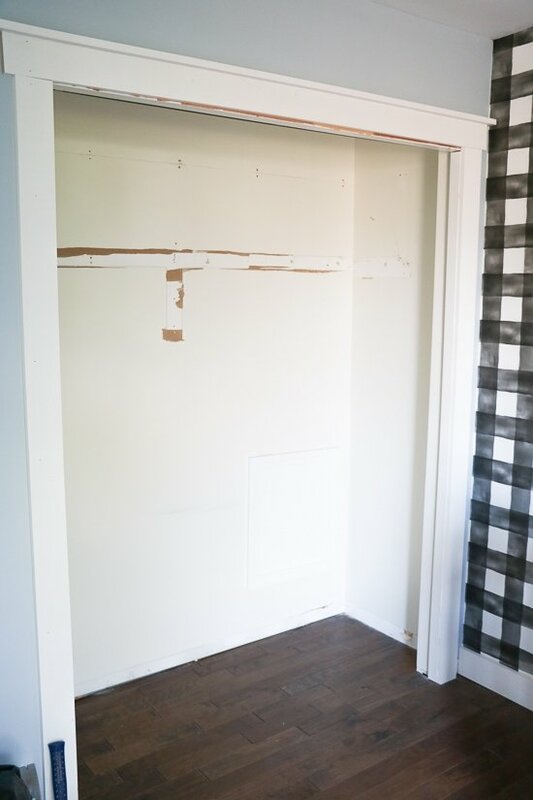 Here’s where the closet stood earlier this week – demo was done and we had a blank slate to work with. 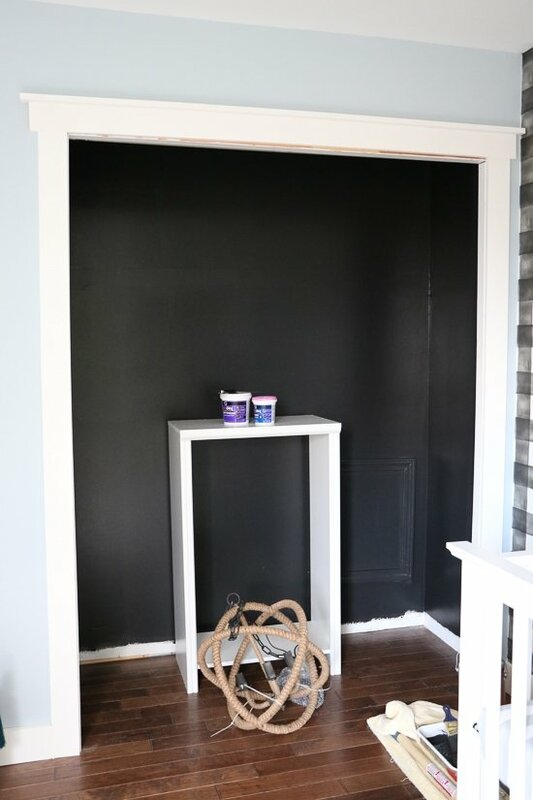 Just like we shared in last weeks post, we picked out a dark paint, Benjamin Moore’s Black Beauty from their 2018 collection, and added some closet organizers. 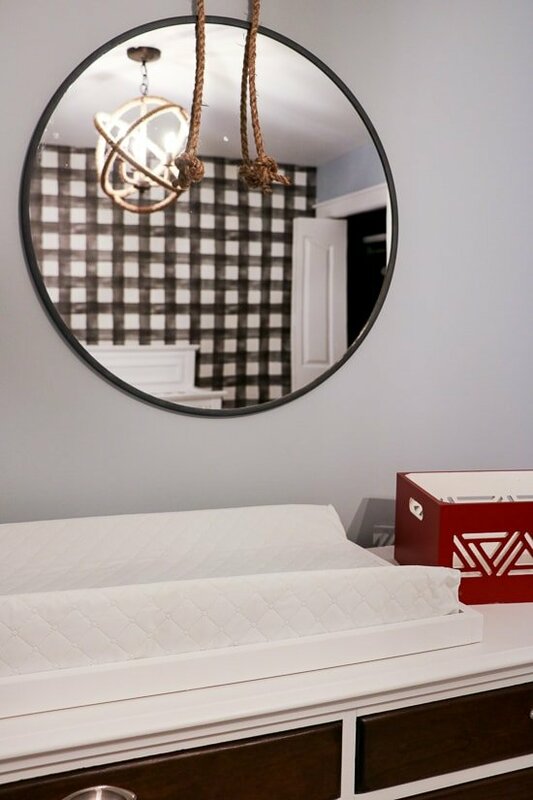 In terms of the smaller projects we mentioned, we’re almost done transforming this popular Target mirror, and the changing pad frame just needs to be attached to the dresser. 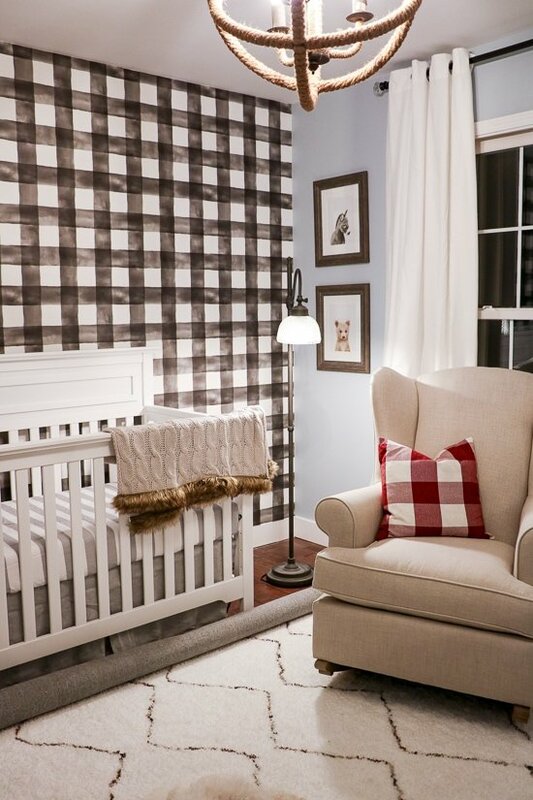 Speaking of the rocker, we’re so stinking excited after weeks of waiting to finally see it in the room! I thought it wasn’t going to make it in time, but luckily the delivery team worked a miracle and it came yesterday afternoon. Now the big question is to footstool, or not to footstool? 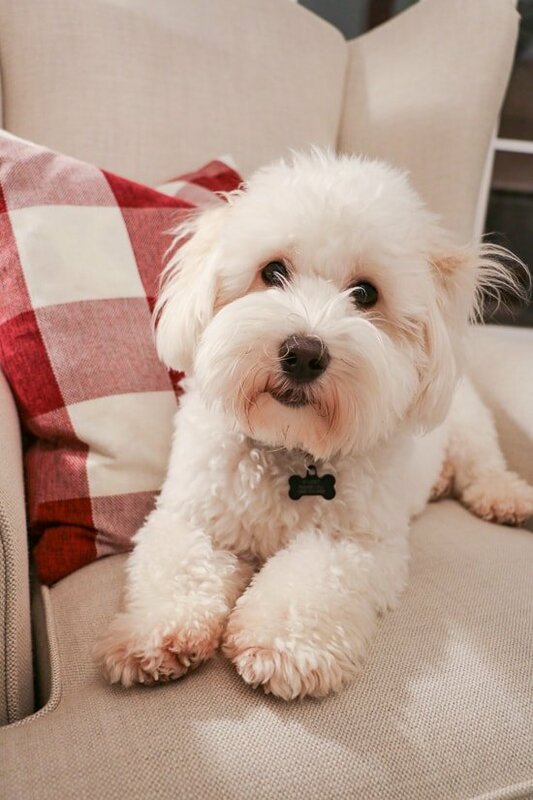 I’m leaning towards footstool and may go pick out some new upholstery fabric to match the room better tomorrow, but would love to hear your thoughts! We still have so much to finish up so that’s all for now, but we’ll be back next week with all of the final details and reveal pictures! We can’t wait! Pst. 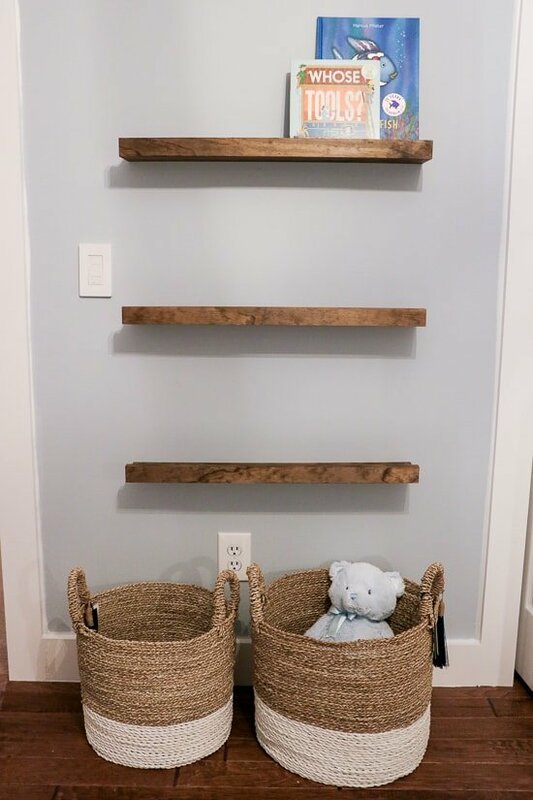 Be sure to check out all of the amazing designers and participants week 6 updates in this Fall’s One Room Challenge, hosted by Linda at Calling it Home! can’t get over that wallpaper … LOVE it and you are almost done!! congrats and looking forward to seeing it all next week! This room is looking so great! I do like the footstool option and perhaps changing up the fabric? Can’t wait to see what you decide! 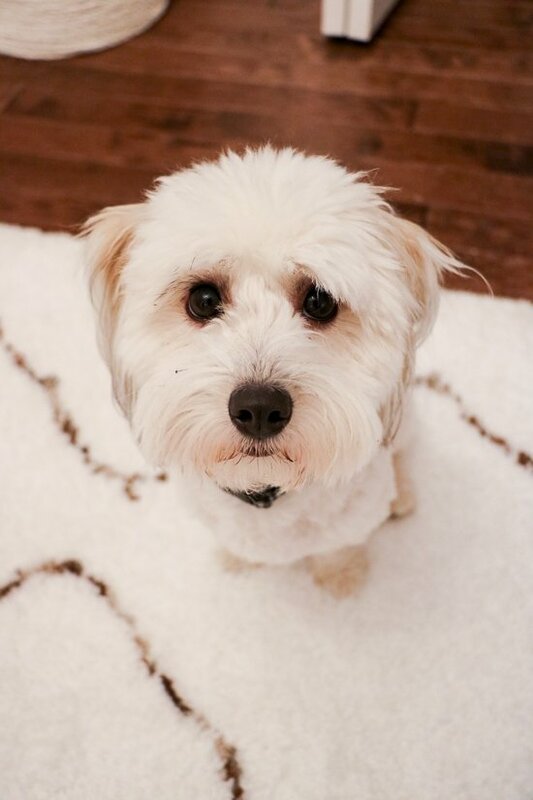 Everything is so adorable. 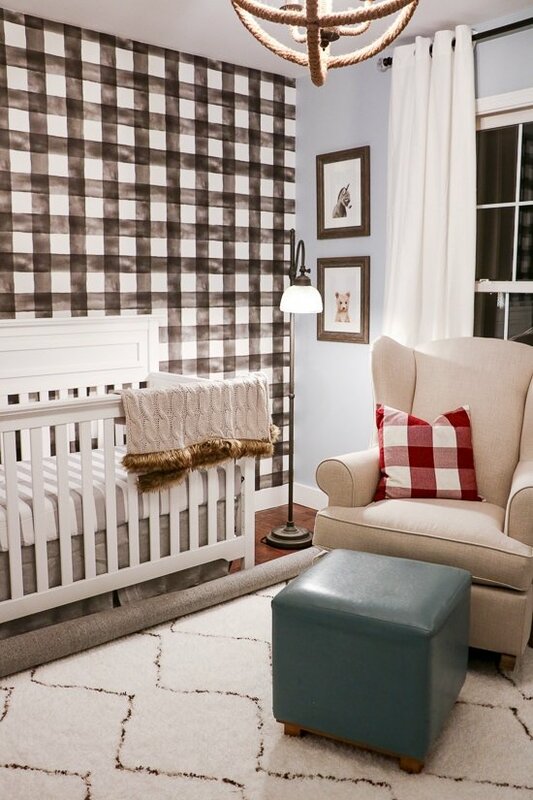 That wallpaper and rocker are absolutely darling!